In addition to the evaluations from the competition, there will be an opportunity for members, in particular new members, to receive feedback on their images. Bring up to 5 images on a Flash drive and the “doctors” will critique as many as time allows. Due to the lack of host clubs, there has been a change to the CAPA Club competitions available for the Spring Round. The PGNS calendar and the competition uploads page has been changed to reflect this. 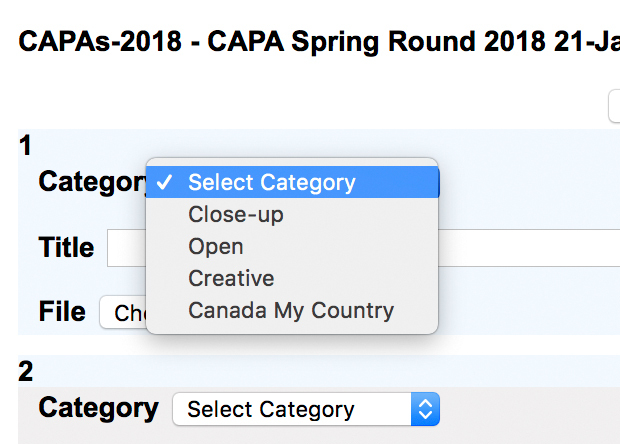 Please remember if you have had an image sent away to CAPA regardless of it being a CAPA Club competition or CAPA individual competition, it is no longer eligible for submission. Images should not have any watermarks, or display the name of the image or photographer when it is projected. The upload deadline of January 14, 2018 remains the same. The image can be of any subject (abstract, landscape, low light, macro, nature, portrait, still life, wildlife, etc… Colour, monochrome or Black & White images are allowed. This category allows Open editing. All in-camera, on-camera and post-processing techniques are allowed. The final image can be a combination of multiple elements as long as all components of the image were taken by the entrant. The image should be manipulated to create a fictional or conceptual image or photographic art. The original photograph must be predominant in the final photo. It can be manipulated in-camera, via post-processing or a combination thereof. However, the image can not be created completely electronically without any photographic content. The image should express the feeling of a time and place in Canada, and/or portray the land, its distinctive features or culture in its natural state and should highlight the natural beauty of Canada. The image can be a landscape, low light, nature or wildlife. Landscapes can be environmental, urban, rural or seascapes. Human, animal and objects can be included to reflect the magnitude of the structures. Ideally, the animals/birds should be native to Canada. Colour, monochrome or Black & White images are allowed. This category allows Open editing. All in-camera, on-camera and post-processing techniques are allowed with the exception of replacing skies. The final image can be a combination of multiple elements as long as all components of the image were taken by the entrant. The principle of this competition is to capture images with extreme magnification or elements not normally viewed. The image can be of any subject (fish, insects, mammals, reptiles, plants, waterdrops, etc… Colour, monochrome or Black & White images are allowed. It can be a detailed and accurate representation of the subject, however creative impression through selective focus, etc is also permitted. Technically a closeup is an image with a reproduction ratio of 1:10 to just under life size (1:1). The goal is to fill the frame with the subject without cropping. This category has Restricted editing. Cropping to simulate a macro image is not allowed. Basic editting cleanup, white balance adjustment, tone adjustments, colour corrections, clarity, vibrance, saturation, sharpening, dodging/burning as well as focus-stacking and multiple exposure is allowed. For the Close-up competition, the entrant must make available to the Director of Competitions, the original JPG or RAW files with the metadata. If your image is selected to go away, I will be collecting those original images by WeTransfer as the turnaround time for image verification is very short. If your image is horizontal, it must be exactly 1400 pixels wide but no taller than 1050 pixels high. If your image is a vertical, it must be exactly 1050 pixels tall, but no wider than 1400 pixels long. This entry was posted in 2018, CAPA, Competitons on January 16, 2018 by Darryl Robertson.